Sac and Fox Nation of Missouri in Kansas and Nebraska is one of three federally recognized tribes of the Sac and Fox people. The Sac and Fox Nation of Missouri in Kansas and Nebraska is headquartered in Reserve, Kansas. The Sauk/Sac were called the ‘People of the Yellow Earth’ which distinguishes them from the Foxes who were called the ‘Red Earth People’. The Sac and Fox Nation of Missouri people and their ancestors have been historically located in Canada, Michigan, Wisconsin, Illinois, Iowa, Missouri, Kansas and Nebraska. The Sac and Fox of the Missouri band were finally settled to the northeast corner of Kansas. One of the largest Indian villages in North America was Saukenuk located between the Rock and Mississippi rivers in Illinois. At this time it included approximately 4,000 Sac and Fox people. The Treaty of 1804 ceded all this land to the government and ultimately started the Black Hawk War in 1832. Black Hawk did not believe this treaty was valid and vowed not to give in to the government. Keokuk was a famous Sauk chief who was in favor of peaceful relations with the white settlers. Keokuk was buried in Kansas, but his body was later taken back to Keokuk, Iowa, where the city still honors his name. Mokohoko was a leader when the removal of the Sac and Foxes from Kansas took place in 1869. Mokohoko and some 200 followers refused to go to Oklahoma. 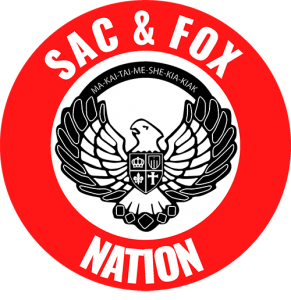 Ne ma ha ha ki – The Sac and Fox Nation of Missouri in Kansas and Nebraska. The Sac and Fox people have long been known for their cultural independence. Despite the many hardships that they have faced over the years, which include losing the majority of their land and people, they have remained a viable group who are proud of their ancestors and heritage. The Nation has a Museum located in Reserve, Kansas which has displays of artifacts, pictures and more history. The Treaty of 1837 removed the Sac and Fox Nation of Missouri into Kansas across the Missouri river to the Great Nemaha reservation in Doniphan and Brown counties. The Missouri band became officially known as the Sac and Fox Nation of Missouri in Kansas and Nebraska. Sac and Fox Nation of Missouri in Kansas and Nebraska is one of three federally recognized tribes of the Sac and Fox people. The Sac and Fox Nation of Missouri in Kansas and Nebraska is headquartered in Reserve, Kansas. The Sac and Fox Nation are Algonquian speaking people of the Woodland culture. The Sac and Fox people have long been known for their cultural independence. Despite the many hardships that they have faced over the years, which include losing the majority of their land and people, they have remained a viable group who are proud of their ancestors and heritage. The Nation has a Museum located in Reserve, Kansas which has displays of artifacts, pictures and more history. They also offer several services and programs to their members including those involving education, housing, youth, and domestic violence. They operate several enterprises and have a gaming commission.